An Army intelligence officer claims the abuses at Abu Ghraib took place after interrogators came under pressure from Bush administration officials. In a sworn statement to Army investigators obtained by USA Today, Army Lt. Col. Steven Jordan, the top military intelligence officer at Abu Ghraib when abuses occurred, said he was under intense pressure from the White House, Pentagon and CIA last fall to get better information from detainees. He also said he had worked out a procedure with CIA interrogators to hide five or six inmates from Red Cross inspectors in October, the newspaper reported in Friday editions. Jordan's statement said he was reminded of the need to improve intelligence "many, many, many times" and the pressure included a visit to the prison by an aide to White House national security adviser Condoleezza Rice, the paper reported. To rebut Jordan's account, the White House arranged an interview with White House homeland security adviser Fran Townsend before, but in anticipation of, the newspaper's publication. Townsend, who last fall was Rice's deputy for combating terrorism, told The Associated Press she visited Abu Ghraib and even walked through a cellblock but "we never discussed interrogation. We never discussed interrogation techniques. That wasn't the focus." "I did not go there to pressure them to do anything they weren't doing," Townsend added. "I really wanted to understand how they were taking the information they had and what they were doing with it so that I could ^=… think through how we could make that dissemination of information most effective." Jack Goldsmith, the Assistant Attorney General for the Office of Legal Counsel, announced on Thursday that he was resigning at the end of July. The Office of Legal Counsel is embroiled in a dispute over Bush administration memos that contend neither the president, nor anyone acting on his orders as a wartime commander-in-chief, can be held liable under anti-torture laws. Goldsmith was a Pentagon adviser when a similar memo was drafted there. Goldsmith said he was resigning to return to academia. A former Army ranger hired by the CIA to conduct interrogations was charged Thursday with assaulting an Afghan detainee who died after two days of beatings, the first time civilian charges have been brought in the investigation of prisoner abuse in Iraq and Afghanistan. Defense Secretary Donald H. Rumsfeld told reporters he ordered an alleged member of an Iraqi militant group held without notifying international authorities in a timely fashion, as required under the Geneva Conventions. He did so at the request of CIA Director George Tenet. The defense secretary said such a decision would be made to prevent the prisoner's interrogation from being interrupted. 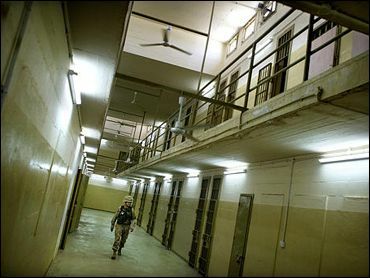 The Bush administration has been stung by harsh criticism at home and abroad over mistreatment of prisoners, most notably at the Abu Ghraib prison in Iraq. The Defense Department and other agencies are investigating abuse allegations. No civilians have been charged in connection with Abu Ghraib, though Ashcroft said the Defense Department had referred one case to the Justice Department for investigation. Seven soldiers were charged by the military. A four-count grand jury indictment was handed up in Raleigh, N.C., against David A. Passaro, 38, for the June 21, 2003, death of Abdul Wali. Attorney General John Ashcroft said Passaro was accused of "brutally assaulting" Wali at a U.S. base in Asadabad, Afghanistan. Wali, the prisoner who died last year in Afghanistan, was described as having participated in rocket attacks against a U.S. base in mountainous northeast Afghanistan about five miles (eight kilometers) from the border with Pakistan. Al Qaeda and Taliban fighters are active in the region, Ashcroft said. U.S. officials wanted to talk to Wali, and on June 18, 2003, he came to the base gate to surrender, according to court documents. Wali died in a cell at the base after two days of beatings by Passaro, who used "his hands and feet and a large flashlight," the indictment alleged. Passaro is charged with two counts each of assault and assault with a dangerous weapon — the flashlight. He faces a total of up to 40 years in prison, if convicted, and up to a $1 million fine. Federal law allows civilian charges to be brought against U.S. citizens for crimes overseas. Passaro was arrested Thursday and ordered held without bond after a brief initial appearance before a federal magistrate in Raleigh. Passaro, who was shackled around his wrists and legs in the courtroom, will have a detention hearing Tuesday. "We were stunned today when he was picked up," said Passaro's attorney, Gerald Beaver. "We've been in consultation with the government since March and it was my understanding that he would be allowed to surrender if there were any indictments." Wali's case initially was referred to the Justice Department by the CIA in November. Ashcroft said the indictment sends a message that "the United States will not tolerate criminal acts of brutality" against detainees. U.S. officials said Passaro's contract with the CIA began in December 2002 and that he arrived at the Afghan base in mid-May 2003, only a few weeks before the alleged abuse occurred. In a statement, the U.S. Army Special Operations Command at Fort Bragg said Passaro was arrested at the post Thursday morning. Passaro, a former Special Forces medic, was on leave from a civilian Army medical job at Fort Bragg while doing the contract work for the CIA, it said. Wali's is among three detainee deaths being investigated by the Justice Department and CIA's inspector general in Iraq and Afghanistan. The Justice Department declined to bring charges in a fourth death. CIA spokesman Mark Mansfield noted that the allegations were promptly reported after the death occurred. Ashcroft said Passaro was returned to the United States shortly after Wali died.